Chicago Review Press, 9781613733486, 272pp. Amy and Jimmie were not sailors. Their experience included reading a few books, watching a couple of instructional videos, and sailing once a week for a year. They were land-lubberly, middle-class twentysomethings, audacious and in love. All they wanted was to be together and do something extraordinary. They quit their jobs, bought a boat that was categorically considered "too small" for ocean sailing, and left Portland, Oregon for the Sea of Cortez. 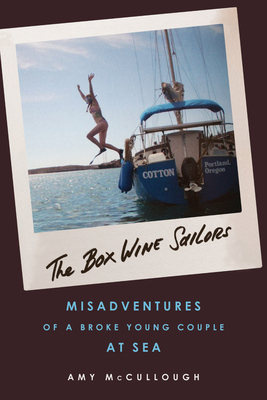 The Box Wine Sailors tells the true story of a couple's ramshackle trip down the coast, with all the exulting highs and terrifying lows of sailing a small boat on the Pacific. From nearly being rammed by a pair of whales on Thanksgiving morning and the terrifying experience of rounding Punta Gorda—hanging on to the mast for dear life and looking about at what seemed like the apocalypse—to having their tiller snap off while accidentally surfing coastal breakers and finding ultimate joy in a $5 Little Caesar's pizza. It also tells the story of two very normal people doing what most people only dream of, settling the argument that if you want something bad enough you can make it happen. Amy McCullough is the former music editor of Willamette Week, Portland, Oregon's Pulitzer Prize-winning alt-weekly newspaper, and has also written for Eugene Weekly and SAIL Magazine.